This Mask on the Foreground tapestry shows a mask from the Carnival of Venice. As an annual celebration in Venice, the Carnival is a tribute to the victory of the republic of Venice against the forces of Ulrich II of Aquileia from 1162. Masks became an integral part of the celebration and have made this festival most famous in this regard. The style of masks in the carnival is distinctive and evolved to a fine art form with mask makes through the decades. The Carnival concludes with the celebration of Lent, on Shrove Tuesday (also known as Mardi Gras), the day before Ash Wednesday. 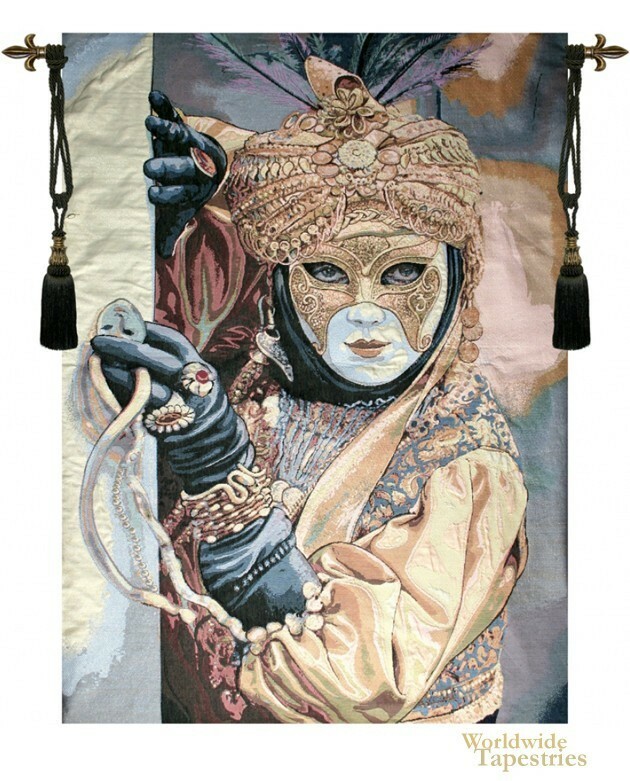 This wall art tapestry is backed with a lining and a tunnel for easy hanging. Note: tapestry rods and tassels, where pictured, are not included in the price. Dimensions: W 25" x H 17"
Dimensions: W 34" x H 25"